Appleby Bermuda’s annual Law Student Summer reception will be taking place on 10 August 2016 from 5:30pm – 7:00pm at Appleby’s offices on 22 Victoria Street. 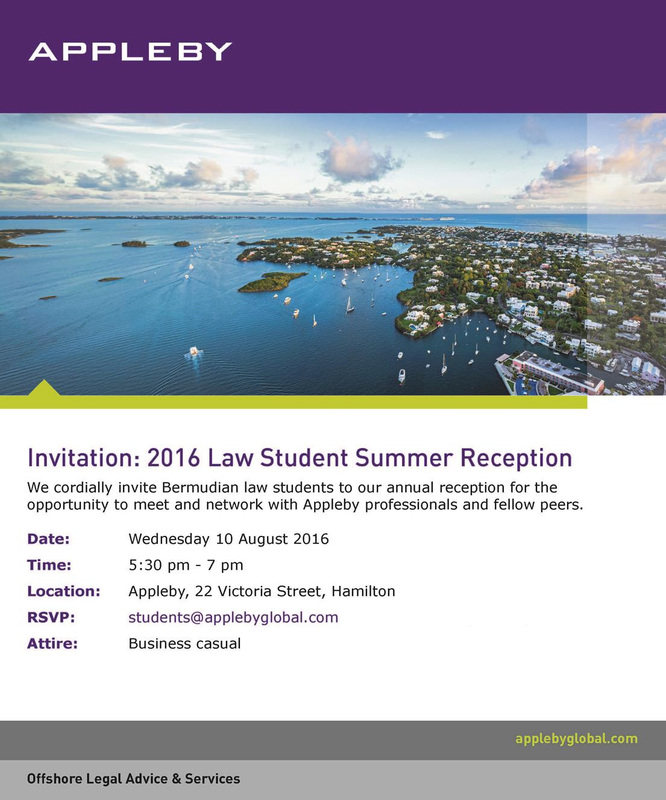 The event is open to all law students for an opportunity to meet and network with Appleby lawyers and fellow peers. Students will learn about opportunities at Appleby, such as the Pupillage Programme. During the programme, individuals complete four six month seats practising in Corporate, Dispute Resolution and Private Client & Trusts. Each trainee is assigned a mentor with the ultimate aim being a final seat in the practice area the individual intends to practise within. Trainees in the programme will also be eligible to be called to the Bermuda Bar after one year. The reception will also discuss Appleby’s legal education scholarship award for Bermudian students studying law who have the intention to return to Bermuda to practise. The scholarship is based on academic performance, community involvement and extracurricular activities. The reception will be held at Appleby’s offices on 22 Victoria Street where refreshments will be served. Students are encouraged to RSVP at: students@applebyglobal.com The dress code is business casual.